This month we are posting on a few masonry-related topics in honour of an upcoming visit by our friend Gerard Lynch, who is leading heritage masonry workshops at Evergreen Brickworks, from October 23 to 31. Today’s post is on an ingenious but little-known art called tuckpointing. The term tuckpointing is often used today as a synonym for repointing, the replacement of old mortar in brickwork. But historically, this term in fact refers to a less common subtlety of the mason’s practice. In use for centuries in England, tuckpointing is a way to produce the impression of very fine, precise mortar joints – even with inexpensive, irregularly sized bricks. In such cases, the mason must accommodate the irregular bricks by constantly varying the amount of mortar used. When a wall is built, the mortar is left just shy of the brick face and a coloured mortar, or stopping, is applied to create a flush face. A colour wash is then applied to the entire surface, staining the mortar and brick to appear more or less uniform. Next, fine, straight grooves are scored into the wall’s surface and a black or white lime putty is “tucked” into the grooves. The result is essentially a drawing of more precise jointing. 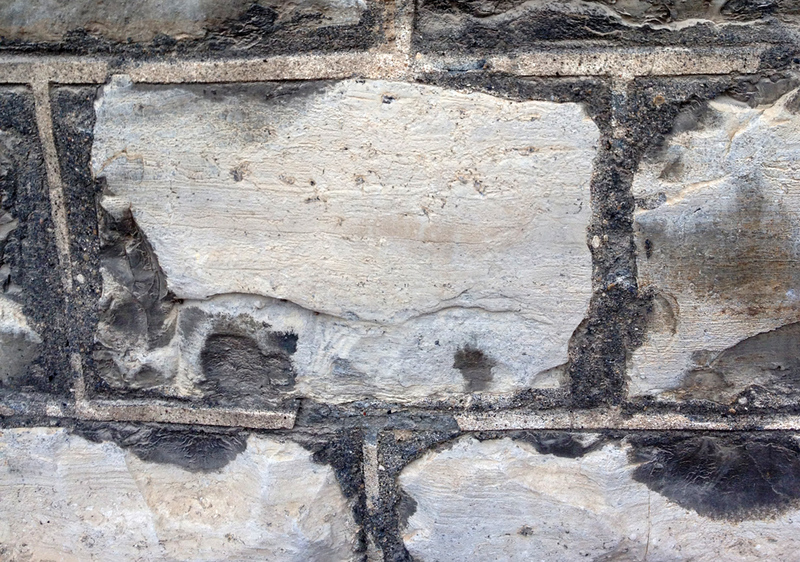 In the image above, the jointing mortar is visibly paler than the brick, and the lime putty is a much brighter white overlaid on both brick and mortar. The image below, which shows a detail from the Stone Distillery at Toronto’s Distillery District, shows how the technique of tuckpointing can be used in stone masonry as well. To learn more about traditional brick and mortar techniques, please consider joining us for one of Gerard Lynch’s masonry workshops.